West Midlands Police have launched a manhunt after a 16-year-old girl was fatally stabbed on a bus in Birmingham as she travelled to school. Police have described the attack as "sporadic" and "quick" and it is not yet known whether the victim new the attacker. 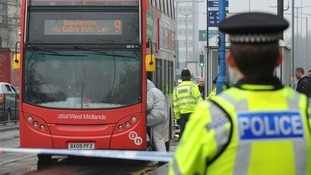 Detective Superintendent Richard Baker described the suspect as "dangerous" and released a description of him at the scene on the Hagley Road in a briefing to the media. Members of the public are urged not to approach him, as he may still be carrying weapons. Officers from across the force - supported by police dog handlers, firearms officers, transport police and others - are now searching for the person responsible. Forensic teams remain at the scene in Birmingham. Credit: Press Association. This is a tragic case and the victim’s family are devastated. Few of us can imagine what they are going through and we are working hard to indentify the offender which involves speaking to a large number of people who witnessed the attack. From their descriptions, we are keen to identify a young black man in dark clothing who was on the bus and seen fleeing from the area around the time of the murder. I would urge the public not to approach the man but to immediately dial 999. We have officers ready to respond immediately to sightings. Officers have spoken to a large number of witnesses at the scene but anyone with information which may help police find the person responsible for killing the girl should call officers immediately on the dedicate incident room hotline: 0800 096 0095.